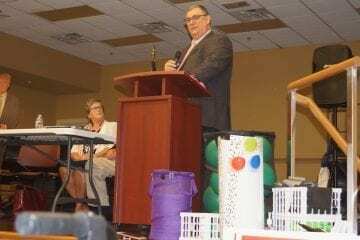 Dare County Republicans held their annual convention on Saturday at the Dare Center in Manteo. Typically, the gathering in a non-election year would have focused more on housekeeping matters, the election of county party leaders and strategy sessions to recruit members and raise awareness of the party. But the death of U.S. Rep. Walter Jones, the long-serving congressman for the state’s 3rd Congressional District, has prompted a special election that has resulted in 26 candidates from four political parties declaring for the seat, including 17 Republicans. The result was a change-in-agenda as Dare Republicans added time for candidates to make their pitches for the party nomination. The 3rd is the state’s largest district, sweeping from Chowan County and northeastern North Carolina, the Outer Banks, and south to include Kinston, Greenville, Jacksonville. It features a mix of military bases, rural farming communities, resort areas, commercial fishing centers, important universities, and hospitals as well as smaller towns that were once home to manufacturing facilities that fed larger factories in the north with everything from car parts to food products, chemicals and other finished goods. State Rep. Bobby Hanig, who represents the 6th District, opened the meeting with some updates on happenings in the General Assembly. Dare County Sheriff Doug Doughtie was keynote speaker. Dare County Sheriff Doug Doughtie took the podium as the keynote speaker. Doughtie’s speech focused not on the partisan aspects of the immigration debate but instead, offered a rather matter-of-fact summary of how immigration enforcement differs between counties, legislation introduced in the General Assembly to attempt to make enforcement more uniform across jurisdictions, and statistics of arrests and undocumented population concentrations. Of the 17 GOP candidates vying for the nomination, nine appeared in person and one sent her spouse to speak in her place as she was working as an on-call physician that day. Of the 10 candidates represented, three were women, two were physicians, five had prior military service, including two aviators, one was married to a career military officer, one comes from a strong Native American heritage and about half were involved in some form of business, mostly as self-employed entrepreneurs. Celeste Cairnes, Emerald Isle — Cairns described herself as a political newcomer and a “non-traditional candidate.” She noted that “politicians have gotten us into a world of hurt, so maybe it’s time for a non-politician to serve.” She is a CPA and has worked for a number of corporations and top-tier accounting firms. Her husband is a West Point graduate and a career Army Special Forces officer and he continues to work for the Marine Corps as a civilian at Camp Lejune. Her two children attend East Carolina University with one enrolled in the college’s ROTC program. Cairnes supports building the border wall, is pro-life, and vowed strong support for Second Amendment gun rights. Dr. Joan Perry is a pediatrician from Kinston and was represented by her husband Jimbo, who told the crowd she had been on call all night and was unable to attend. He described Dr. Perry as “tough as nails,” telling a story of how she was able to combine a bird and deer hunting excursion on the day she gave birth to one of their five sons. She is an avid marathon runner, volunteers for the YMCA as a camp doctor, and worked in both the McCrory and Martin administrations in Raleigh on health and human services and day care commissions. She vows to be “100 percent transparent” and her prepared remarks expressed opposition to what she called the “infanticide” allowed by recent changes in New York abortion law. Francis Deluca — A retired U.S. Marine Corps colonel, Deluca is best known for serving as CEO for the conservative Civitas Institute, from which he recently retired. He focused on support for building the wall along the border with Mexico, citing the strategic use of walls employed in his 30-year military career. Paul Beaumont is one of two elected members of the Currituck County Board of Commissioners seeking the 3rd District nomination. A former Navy aviator, Beaumont said he “escaped Virginia” to locate in Currituck, where he and his wife have 11 children. 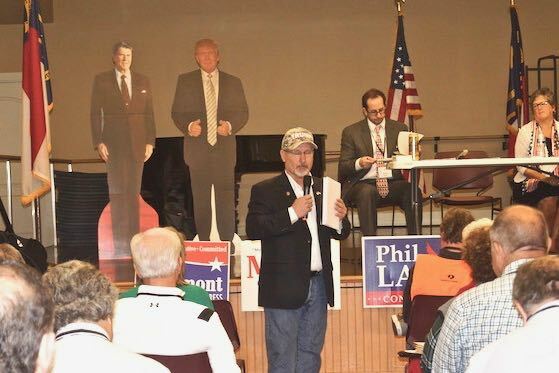 His remarks were mostly humorous, and he outlined his positions by stating if “AOC” (New York Rep. Alexandria Ocasio-Cortez) represented one set of positions, he was the “anti-AOC” candidate. He expressed strong support for President Trump and the border wall and commended Trump for sticking to the issues he promised to address in his campaign. Michael Payment is the other Currituck commissioner in the race. Payment owns and operates his own business, CT Mechanical, served in the U.S. Navy, is a volunteer firefighter and noted his father was 100 percent Chippewa and his mother was also Chippewa, making him 80 percent Native American. Dr. Greg Murphy, a neurological surgeon, currently represents N.C. House District 9 in the General Assembly. He expressed support for President Trump, describing him as “a man of his word who sometimes has barnacles in the way he says things” but had kept his promises to deal with the issues he promised in the campaign. He described himself as a Reagan conservative who opposes Medicaid expansion, supports the border wall, and a balanced budget. Phil Law, a former Marine Corps veteran, challenged Rep. Jones in the 2018 primary, coming in second in a three-way race. Another younger face in the crowd, Law said he “represented a new generation of leadership” in the party. He pledged to combat illegal immigration, which he said was “destroying the country” and pledged to work hard for veterans, who “had been relegated to third-class citizens” in the medical system while “illegal immigrants receive free care” that he described as often better than that received by veterans. Law served in Iraq in a combat role and noted he was enlisted, contrasting himself to other candidates who were officers in the military. Michelle Nix is the former vice-chair of the North Carolina GOP and she recently retired as an investment adviser for a division of First Citizens Bank. She expressed support for President Trump. A resident of Kinston, Nix told the convention Lenoir is one of the poorest counties in North Carolina and she vowed to work to improve the economic conditions in the poorer counties of the district if she is elected. Michael Speciale served in the U.S. Marine Corps for 22 years and currently represents N.C. House District 3 in the General Assembly, where he is now serving his fourth term. A resident of New Bern, Speciale said he would represent the district, not the state if elected, and recited his support for commercial fishing in the state, where he stated he had helped beat back every attempt by other interests to hurt that industry. He mentioned he was willing to work with others but not afraid to be combative if needed to serve his district. 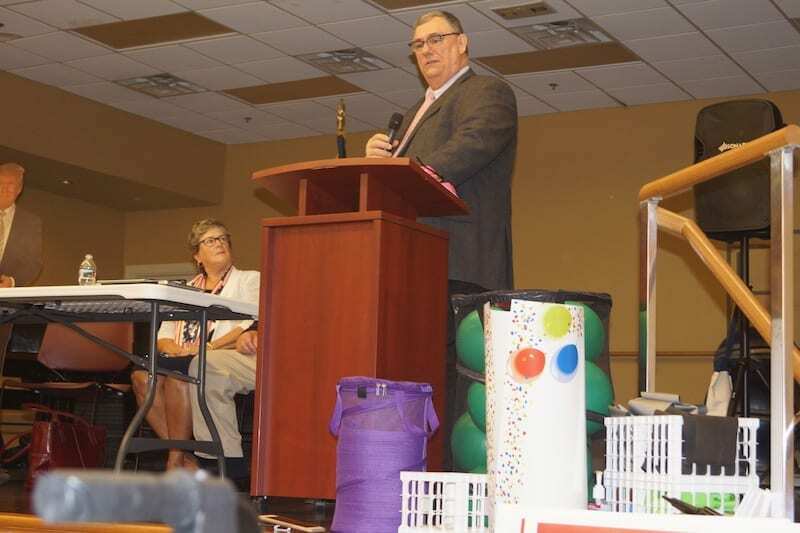 He mentioned that there were well-heeled candidates in the race and told the convention “don’t let this seat get bought.” He vowed to make constituent service his number-one priority. I can’t believe they reappeared!!!! I couldn’t help but notice that not even one candidate even mentions our environment not one. Is that a bad word with the Republican Party. Just because your leader doesn’t believe climate change. Start thinking about the world we live in..
Reagan wouldn’t be caught dead standing next to the moron to his left! LOL, the cardboard cutouts. Who does that?